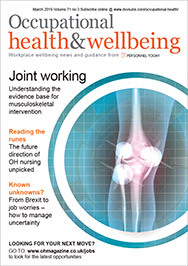 The national director for work and health has called on NHS occupational health (OH) nurse practitioners to take more responsibility for public health, and to work with GPs and employers to promote more healthy and resilient workers. Although many OH nurses do not think health promotion is part of their remit, the profession should address “non occupational health issues” such as smoking, weight and alcohol abuse, Dame Carol Black told delegates to the annual conference of the Association of NHS Occupational Health Nurses. “Keeping people healthy in the workplace – should that in the future be part of occupational health?” Black asked delegates. She applauded the approach of Hitchingbrooke Hospital which has cut absence from 6% to 4% and saved £500,000 in recruitment agency costs. “If the top trusts with the highest rates of absence could get their figures down to average, then 2,000 additional people would be available every day,” said Black. She argued for better communication between GPs and employers, and for OH to take responsibility for health promotion, to be concerned with employee productivity, and to focus on mental health and stress, the ageing workforce, equal opportunities and chronic disease. She said work was under way to revamp the GP sicknote so that patients might be able to give permission for GPs to communicate with OH within organisations. Black also commented that ‘occupational health’ was not the ideal name for the profession. “I wish I could think of a better name because it doesn’t give the right message – it’s too negative,” she said.